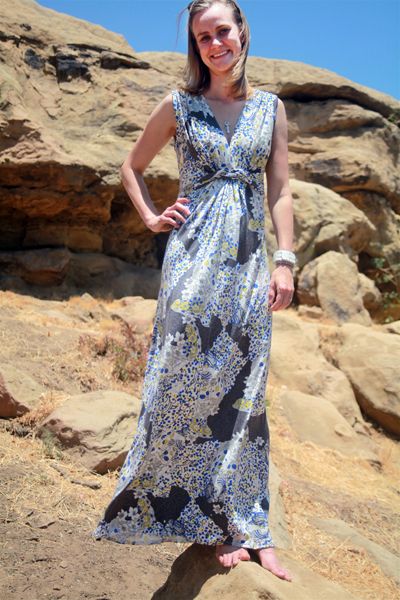 To celebrate the coming arrival of the summer solstice here in the US, what could be better than making a maxi dress out of a luxurious silk jersey from Mood Fabrics? One of my newfound favorite fabrics draped all over me? Yes, please! 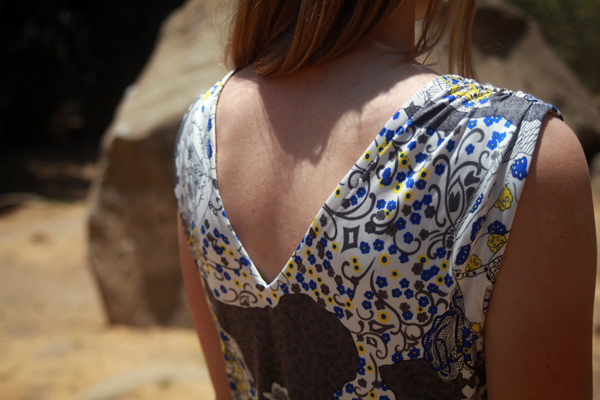 I’ve had my eye on Mood’s online silk jersey print section ever since making my silk jersey bow top last summer. I’m a bit embarrassed to admit I wear that top almost weekly. While I have a thing for bow tops, I know the reason it’s one of my go-tos is the fabric. I didn’t want to miss my chance to make another favorite top (or dress!) because a great print sold out before I could get to it. When I saw the bold print that I used here in Mood’s online silk jersey section, with its blues and grays and little pops of yellow – and with its art deco woman covered in flowers, I was enthralled. The large size of the repeat suggested it would do well as a dress, and the flowing nature of the print made me want to gather, twist, and drape it all over my dress form as soon as it arrived at my door step. Because I’m still not ready to venture into true draping, I kept looking for a pattern that would match my dress form vision. Ultimately, I decided it was meant to be BurdaStyle’s Twisted Maxi Dress 02/2013 #115. The pattern has a bit of cool twist action that looks complicated but ends up being pretty straightforward to make happen. I know people say BurdaStyle instructions aren’t always that helpful, but I found the instructions for this pattern to be very informative. They had plenty of diagrams walking through the parts that could be a bit more complicated. Basically, after prepping the top front of the dress and the bottom front of the dress separately, the bottom is then threaded through a small hole left in the top, and then the two are carefully stitched together. That’s really as tricky as the twist gets. As an aside, part of the prep is to sew a small center front seam that defines how low the V neckline goes, and I’ll admit to more than doubling the suggested length of that seam since the original was scandalously low! The twist becomes ties in the back that fall nearly to the ground. The twist and ties are attached at the side seams, so the secureness of the bow in the back has nothing to do with the tautness of the twist in the front. Thankfully, the latter is fixed, especially considering how many times I accidentally untied the bow in the back just from sitting down while I was wearing this dress to a wedding in Southern California this past weekend. The shoulders have just the right amount of gathers held into place by stitching them to stay tape, and the back has a nice V stabilized by some clever use of self binding. The armholes are also finished with self binding. All other seams are either enclosed or serged. The silk jersey was a dream to work with throughout all of the gathering, basting, stitching, and serging I did to complete this dress. And, this dress took mere hours to make from start to finish, which is huge for me because I usually drag things out for days if not weeks! If you’ve never sewn with silk jersey, I recommend you give it a try. If you have sewn with it before, I’d love to hear your successes in the comments. I want to start plotting my next adventure with this wonderful fabric, and I’m looking for inspiration!